If you posted an audiobook review today, Tuesday June 22nd, please leave your link in the Mr. Linky before midnight Central time (US) and you will be eligible to win a prize. After his attempt to be a famous Hollywood filmmaker fizzles out, Eric Shaw finds himself in Chicago, making films – essentially slide shows – for events like weddings and funerals. Based on his work for one funeral – in which he includes a seemingly-insignificant picture that turns out to have been extremely significant for the deceased – he is approached by a woman who wants him to do a documentary about the early life of her husband’s dying grandfather. Eric travels to French Lick, Indiana, home of the newly restored resort hotel, carrying with him a bottle of the region’s famous Pluto water. Strange things begin happening, however, and what seemed to be a simple documentary is now a mystery that Eric must unravel for his own safety. This was my first Michael Kortya, but I doubt it will be my last. Eric’s character was complex and relate-able and truly human. The story built slowly enough that events seemed to happen naturally, but not so slowly that I was every bored. I love the pitch that he built to, and I was rapt by the story that Kortya created; he balanced the supernatural aspects perfectly as well. Let’s add Robert Petkoff to my list of narrators on whom I have an audio crush. He has an amazing voice that makes you just want to melt, for one thing. For another, he does a fabulous job differentiating between the voices of different characters without making it sound unnatural, as if he is trying to hard. I don’t always appreciate sound effects other than the narrator’s voice in my audiobooks, but there are a couple of scenes where Eric hears wind or a violin, and Hachette Audio did a fabulous job weaving those sounds into Petkoff’s narration so that as the listener I felt I was in Eric’s head, hearing the things that he was hearing. 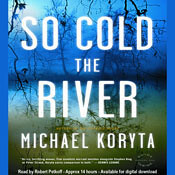 “So Cold The River” was sort of a suspense-y, mystery, not-quite-thriller sort of book. Those don’t always make for my favorite reads, but this one was both beautifully and artfully written and expertly narrated, and I definitely recommend it. This review was done with a book received as an audio download from Hachette. I can’t wait to start listening to this one — everyone has such good things to say about it. I loved this book and can imagine it was wonderful as an audio! Great review! I have the print version of this book but I’ve heard nothing but stellar reviews of the audio. I might have to go the audio route, based on your recommendation! Argh! I really wanted to review this one for audiobook week, and I put it on my iPod, but when I got on the plane and looked for it, it had magically disappeared! Still, I’m glad it’s good and I have something to look forward to! I loved your review style on this one..told me just what I wanted to know. That you loved the narrator (big plus for me) and that you enjoyed the story. I may have to listen to this one! I also picked this one up in download format from Hachette while in NY. They knew what genres I liked and suggested I try this one. I haven’t got there yet but look forward to when I can listen to it. I have SO COLD THE RIVER one coming my way this week (in book form, not audiobook). I’m really looking forward to reading it, especially with how you’ve described the author’s writing as “artful” – I LOVE artful writing, especially in a suspense novel. It will be my first Kortya book too, so I’m really looking forward to it. You’ve executed all four components of your review, beautifully. This is definitely going on my wishlist. The references to Chicago and Indiana grabbed this Midwesterner.